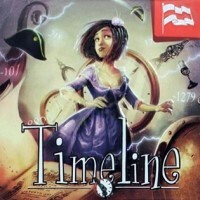 For all games in the “Timeline” series: Instead of discarding the incorrectly placed cards, we leave them on the table. I realize this can be brutal for many, but it really kicks up the difficulty for repeat plays. A passenger, of course, picks a random card from the deck without looking at the date, each of the occupants states the year they think is correct. The person that is closest wins the card. Play until someone gets 10, the deck is exhausted, or someone has had enough of the game. Ties go to war: another card is selected, the tied players each state the year, the winner gets both cards. If you are worried about getting dates that are too hard, or too easy, why not set up a draft? Everyone starts with a hand but then selects 1 card, puts the card in front of them, and then passes the others to their left. You will probably get stuck with at least 1 tough card at the end, but this way you will have some control over what cards you get. When the first card is placed on the table to start the timeline, instead of placing date side up, leave it face down. Players can then each take their best guess as to the exact year on the card. The player closest to the actual date goes first.